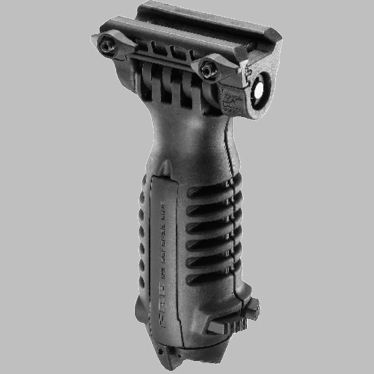 The only fully functional bipod designed for precision shooting built into a vertical foregrip. Built for designated marksmen and those operating in urban settings who need to transition from close fighting to precision shooting. An ergonomic foregrip based on our popular TAL-4 grip. A touch of a button transforms the grip into a sturdy bipod. Legs are independently adjustable for height. Bipod allows slight pivot to adjust cant. Wide stance offers stability lacking in other grip bipod designs. Mounts with captive quick-release wingnuts. Aviation-grade Aluminum, steel, and MIL-SPEC reinforced polymer composite.